Do you need attic ventilation installed or replaced? If your attic isn’t adequately ventilated, it’s costing you a lot of money on utility bills. Whether your home is new or older, ensuring the attic stays dry and ventilated is very important to maintaining an energy efficient house. Installing the best attic ventilation system is an important factor in keeping your home as energy-efficient as possible. It’s one of the most overlooked areas by homeowners. Just because you don’t see that area of your home very often, doesn’t mean attic ventilation isn’t important. Temperature – in the summertime, the attic is most likely the hottest place in your house (when the outside temperature is 95 degrees, the attic temp can get up to around 150 degrees). With all that excess heat up there, keeping the room(s) in your home cool means that the air conditioning system has to work harder. Moisture – if vapor barriers are not used in the ceiling, any moisture that is produced in the living areas can migrate to the attic. With inadequate attic ventilation, this moisture condenses and can cause deterioration in insulation and the roofing structure. One of the best things you can do to increase attic ventilation is to have a ridge vent installed. 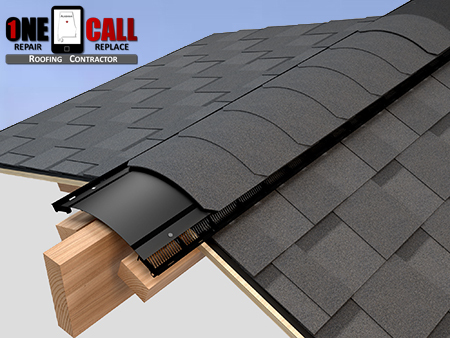 This type of attic ventilation is installed along the peak or “ridge” of your roof. This system is screened, doesn’t require electricity and it replaces the top row of shingles that bridges the very top of your roof. 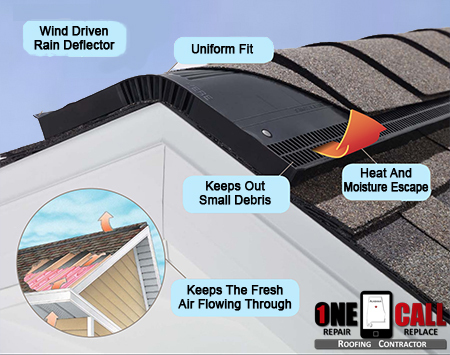 The ridge vent allows air to flow in or out of the attic area, along the entire length of the vent installed on the roof. If you have soffit vents, they will work wonderfully in combination with a ridge vent. The heated air from the attic rises and goes out of the ridge vents, while cooler air is entering the attic from below via the soffit vents. The nice thing about this type of system is its uniformity; there are no “hot spots” of non-moving, overheated air. 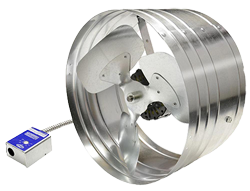 Another type of way to help ventilate your attic in the summer is through the use of an attic fan. The idea here is that the fan pulls in air from the outside (which is cooler than the air in the attic) through vents, at the same time pushing the hot attic air back to the outside. Two situations can cause a problem with this. One is if the attic vents (located in the soffit) are blocked, and/or two, if the attic does not have a good seal off from the living area. If either or both of these come into play, then the attic fans will pull the cool (air conditioned) air from your living area. This now means your AC system has to work a lot harder to keep the rooms cool. So, one consideration for proper attic ventilation is to remember to never put insulation over the attic soffit vents. At first glance, attic ventilation seems to be contradictory to what we are trying to achieve. Think about it. On one hand, you try to get your home sealed, insulated and weather-stripped to the point where no air can get in or out. So the idea of ventilating the attic – letting it breathe – seems counter-productive. But the attic is a unique place in your home, so the traditional thinking does not necessary apply (at least not completely). Above the attic is all the “bad stuff” outside – rain, hail, heat, cold and all other types of inclement weather. Below the attic is the perfect environment (your home), which is climate controlled virtually all the time. Since the attic resides in between those two extremes, it has to flex a little in terms of temperature and it has to breathe. That is what attic ventilation is all about. If your house was built more than 15 or 30 years ago, chances are the attic ventilation was not a high priority item. 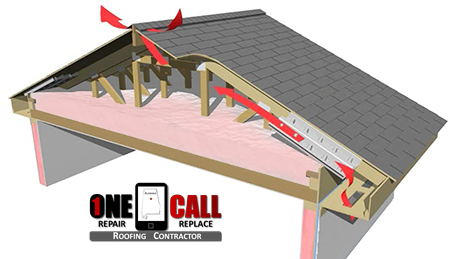 As an Owens Corning Certified Preferred Attic Insulation Contractor, we can advise you on the best course of action to have an attic that “breathes”, and a home that is more energy-efficient. 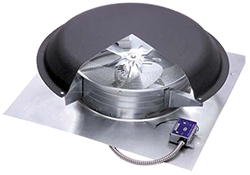 We install and replace attic ventilation in Birmingham, AL and the surrounding area.